I'm mixing it up for this week's featured book... Its not actually a book at all! 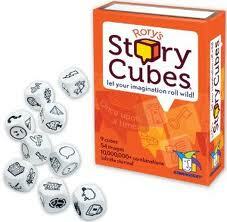 Meet Rory's Story Cubes ! Find em' at bookstores, Target, toystores, and of course, Amazon . Here is the official website. Although week's feature doesn't involve words and pages, it definitely encourages experimentation with storytelling, creative thinking and problem solving, vocabulary development, and use of expressive language/sentence structure. This is a great activity to use with younger students or those who have difficulty reading since there is no print involved (Just like the wordless picture book I presented in my last post). So many options for targets to use with this game makes it a perfect group activity. I can have one kid working on conjunctions, another on carryover articulation, and another on verb tense, all while we're playing the same game! The first time I bring out the cubes I like to have the students go around and name each picture. I explain to them that this game is all about using your imagination and that if you see something different than someone else, that is a good thing! I encourage them to use full sentences and justify their answers - It can be hysterical to hear what the kids come up with and it gives them a good opportunity to practice debating and reasoning amongst one another. The manufacturer recommends this game for kids ages 8-15. I agree with that recommendation if you play by the standard rules with all 9 dice, but I've successfully played with kids as young as 4 with some modifications. One way to structure this game for younger kids is to just limit the number of dice... It is a lot easier to weave together a story with 3 objects rather than 9. You can also help out by taking turns adding to the story - You'd be amazed how well little ones can do with this game if you just start them off with a model (e.g., "One day, I was walking along and a big thunderstorm started. You tell what happened next!"). In group settings, you can also tell the story collaboratively (everyone rolls just one die, then contributes one line in the story development based on his or her roll. In addition to eliciting narratives with the cubes, you can also target sentence structure. I find that using just one or two cubes is best when concentrating on this goal, so as to keep the focus on the sentence rather than bogging the kid down in trying to think of how to get the icons to relate. I will have the child dictate their "story" to me while I write it down verbatim. Then, we read back over the production and change the grammar and word order as needed to reflect proper sentence structure. Sublime Speech has a nice template to use with the game, or you could just use a wipe-off board or old-school piece of paper. Check out Sublime Speech for more ideas for using this product in therapy. Adventures in Speech Pathology recommended using the game to target conjunctions - Love that! I found it works nicely for that purpose if you create a conjunctions die to add into the mix. Just write "and," "or," "but," "yet," "so," "because," and "both ____ and ____" on the faces of a die and roll with two of the story cubes. As Kathryn from Kids Game for Speech Therapy suggested, the story cubes offer a great opportunity to work in some practice asking/answering wh-questions. I find that after a students finishes telling his or her story, there are always some holes in the action not covered by the cubes. So I'll set a limit on the number of questions (3-4) before we begin, and then open it up to the other kids to ask the "author" after he or she has finished telling their story. I hadn't considered using the dice with articulation targets until I read the suggestions made by Activity Tailor... I can see my kids getting a little sick of "Larry likes ______" over and over, but maybe if I mixed up the phrases it would work. That post also got me thinking about making some custom dice for articulation targets. I had my dad make some wooden dice (2" cubes, rounded corners), printed out some /r/ stimuli, then pasted them on. I only did three dice for /r/, but am going to add more soon since they worked so well! The dice can be used in the same way as Rory's Story Cubes. I'm always looking for creative ways to target articulation at the sentence/structured conversational level, and this DIY totally fit the bill! Hopefully you've added this game to your Amazon cart by now!! For those of you that already have them, did I leave anything out? How else do you use these in therapy?